Hello ... Hello ... my old friends ... It's great to see you once again! Wasn't it great seeing Roy Wood and Jeff Lynne last week together on stage in NYC for their Rock & Roll Hall of Fame investiture as founding members of ELO? It was, of course, unfortunate that both Bev Bevan and Richard Tandy were not also there (for differing reasons) but also affirming in that the Electric Light Orchestra were taking their place alongside their peers and fellow musical legends. My elder brother Bob introduced me to ELO when I was but a ten year old back in 1977 and ELO were a settled septet at that time. 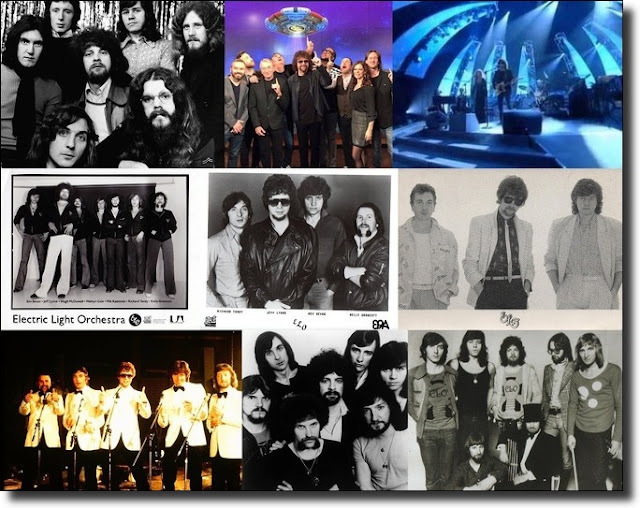 Their membership (whether in the studio or on stage) has expanded and contracted over the years and the idea of this article - published on the 45th anniversary of the live debut of ELO at The Greyhound in Croydon on Sunday 16th April 1972 - is to pay tribute to each and every musician who has played a part in a band whom the late, great Tony Curtis once famously said were (and still are) "the most outstanding rock group in the world today." Many thanx to Messrs. Jet Flynne, Jeff Cooper and John Devitt for filling in the gaps! Very well stated! I have lost respect for Jeff Lynne for not giving a shout out to the guys who were former members of the band. And who helped ELO achieve their goals which would lead them to fame/fortune and the Rock -N- Roll Hall Of Fame. He didn't have to call them all out by name but he should have at least acknowledged their contributions. A real man would have done this. I get he's shy but he is 69 years old and there is no excuse. He is a egotistical jerk who only thanked himself. Didn't even mention the ELO fans who bought his music. During Jeff Lynne's ELO live performances they used photos of Roy Wood throughout the songs but Roy wasn't allowed to go up on stage and do one song with them? And to make matters worse on Jeff Lynne's Facebook page, They post " ELO In " the hall of fame but used a photo of the current Jeff Lynne's ELO. WTH ? I am glad ELO is in the hall of fame but just highly disappointed with the leader of the band. Are they going to include that cringe worthy episode where Jeff Lynne went on "tour" with a girl band ? Jeff Lynne is a genius there is no denying that, but he is mainly a total self centred egoistical @rsehole ! Thanks for a very good article Keith. I never thought I would see the day when ELO were inducted into the R & R Hall of fame. I think it's only right that ELOBF pays respect to all those people who contributed to the success of the band. I know there were many people in many groups saying different people should have been there, and when you look at your list, you can see why. I think it was only fitting though that Jeff who wrote nearly all the songs, and Roy who convinced him to join the Move only on the premise that ELO were formed, attended. When I think ELO, I will always think Bev, Richard, Mik and of course Kelly.